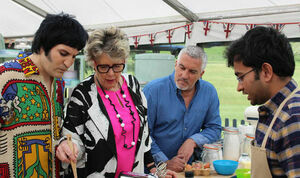 A cake-strewn Great British Bake-Off episode 2 aired on Channel 4 last night. Yes, its Cake week, which is what it’s all about, and I’m am absolutely confirmed in my opinion now that they shouldn’t have started with biscuits. 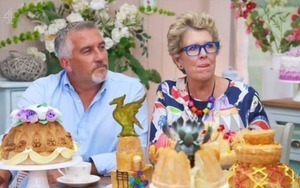 Cake is a far more relevant entry exam for Bake-Off Tenters and last night proved that beyond doubt. Every baker, no matter how diligent or occasional they are should have a daycent traybake within their set of recipes and abilities. And if you’re like me you’ll have developed two oul’ reliables; one for the smallies and a grown-up one. You should also have two tray options; square and rectangular, and as with all kitchen paraphernalia, tools, and appliances, always get the very best you can afford. I’m telling ye all this ‘cause last night’s signature was a great demonstration of what the everyday baker can do very simply, and most importantly, tidily. Traybakes don’t need trappings like sugar twirls or piped ornaments on top like you saw last night to be any less than they are. There were loads to choose from last night; but for the grown-ups I would have to recommend Terry’s rum n’raisin, although I’d skip the candied walnuts; OK there are loads of ingredients to measure out, but most kitchen presses would have them anyway. Briony’s Turron and Orange would make great treat-eats, but d’ya know wha’, I’d no more make marmalade than take up jogging. Also, something for my unlikely to-dos is to finalise a Lemon Meringue traybake recipe; if it ever happens ye’ll be the first t’ know. While I’m here on traybakes, I need to disclose that I love Black Forest an’ting; but for me all that fresh cream and kirsch is wasted on a shallow tray measure; Black Forest deserves to be full-on drag, all glammed-up and never in a corner as a baby no-guilt sized portion. Nonetheless, it’s clear the two last night got away with it. When a Le Gateau Vert was revealed as the Technical it got greeted by a garish and earthy ah’ ffs and its getting another one here now – ah’ ffs! Like why would ya be arsed? Spinach? Pistachio? Green cake? Garish is right for it all day long. I would stop on about it now only I think I should point out that Monet loved his grub, so I’m obliged to mention this book since Broadsheet is all about the non-fiction lately. And that was a handy tip from Jon about blending your butter with a dab of your cake batter before adding into the full mixture. Jon is obviously one to watch already, and I think Bread week might be his star turn, yet I’ll remain open about them all and there’s no favourite yet for me. Although unlike the Black Forest, Anthony’s Bollywood smiles are long past their clichéd date already. Yay! Showstopper time now. But they were far from yays last night; loads of promises alright but nothing you’d put into a shop window really. OK none of us temper chocolate at home, well maybe Martco does. But then he has a kitchen crew to clean up after him. Most of us don’t do fancy stuff with chocolate or sugar because its too much cleaning up afterwards, you need specialised kit and it all tastes the same anyway. I’d no more bother with a chocolate collar than I would iron me tea-towels. That sorta carryon is just for the telly or for places that charge eight yoyos for a slice, and a mane one at that. One showstopper I want to mention is Luke’s Raspberry & White Chocolate. OK, he made a hames of it and had to go, but that cake promised so much and still does as it has everything the Irish palate loves, craves, and deserves. So just for ye, I have reached out to the lad and asked him for the recipe. I hope the Hollywood doesn’t get handshake regret after last night. None last week, but he lost the run of himself with cake week. Star Baker Rahul is no doubt a serious and accomplished baker but has yet to make something I would try myself or even recommend. I’d go so far and say even now in the early days – I don’t think he’s going’ta make it into the big three. Probably my favourite BO innuendo ever; six inches takes 45 minutes eight about an hour; not in my experience but who am I to contradict so enjoy. And I’m loving the range of accents, but tell us, would it be a Commonwealth of accents or an Empire d’ye think? Next week for the rising and somehow, maybe tis just me and that chintzy ‘tash, but I don’t think Terry is cut out for it all. In the meantime, for convenience and t’ keep things more orderly @bakesheet is now set up on the twitter so tag on. 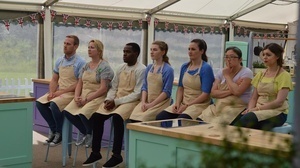 Posted in Misc and tagged frilly keane, The Great British Bake Off at 4:07 pm on September 5, 2018 by Frilly Keane. Frilly Keane, what cake would you bake for a family reunion? I’m at a loss, I love the Hairy Baker’s Spiced Apple Cake, it’s divine but it’s not fancy enough looking. Thanks. Depends on what you’re looking for. I’ve a lovely chocolate sponge recipe that’s really versatile and tou can kind of do anything with. There’s also a really nice buttermilk sponge with berries. I like to use lemon and raspberry in summer, and orange and blackberry at this time of year. Sometimes I go wild and do a vanilla sponge with raspberry and blackberry. But it makes a lovely light sponge and is no fuss to make. If you like the sound of either of them, I can post the recipes. Go on! I’ll give them a whirl. Enough about your bum. This is about cake. Preheat the oven to 180c. Line your two cake tins (7 inch preferably). Cream your butter first. Get it nice and pale and fluffy. Add the sugar and whisk like crazy. Break the three eggs into a jug/cup/shoe, add the vanilla extract and whisk together. Very gradually, add the egg to the butter and sugar mix. Keep scraping down the sides of the bowl (I know it sounds a bit obvious, but it makes a big difference) until all the egg has been added and you have a lovely fluffy batter. I’m paranoid about curdling and this method has been the best one for me. Next, in a separate bowl, sift the flour, cocoa and baking powder together, before slowly folding to the wet ingredients, and will result in a fairly dry looking batter. This is where the yogurt comes in. The natural yogurt will moisten the sponge and react with the baking powder to create a lovely rise. Add two tablespoons and mix, adding a third if you think it needs it. I find that two and bit tends to do the trick nicely. Divide your batter between two tins and lash into the oven for 20-25 mins, until springy to the touch and the cake has begun to shrink away from the sides. When cooked, take out of oven and cool for five mins in the tins before transferring to the cooling rack. Decorate as required. I like vanilla buttercream icing and loads of raspberries. Even just a simple chocolate fudge icing to sandwich the cakes and a dusting of icing sugar. Or boozy orange icing and toasted almonds. Oreo icing for the very sweet toothed. There’s more coming. And clearly I eat too much cake. Pastry is my downfall. Thanks a million Mildred, thanks for taking the time, you’re very good, love the show comment lol. I spend too much of my time thinking about cake, and the result is usually something like this. The chocolate sponge is my go-to for any kind of occasion and it usually goes down well. Hope they’re of some help to you! in a small saucepan, prepare the caramel with 15 pieces of sugar soaked in water. When it is well browned, pour it into a pan. Peel the pineapple leaving no brown particles. Cut into slices about 1 cm thick. Cut out and remove the central fibrous part. Arrange the slices in the bottom of the mold, on the caramel. Or wack it out of the tin. In a bowl, work the butter with a wooden spatula to make it creamy. Add the sugar, mix well, so that the preparation is creamy and well mixed, one after the other,add the whole eggs. Mix the baking powder with the flour and gradually add to the mixture. If you still have pineapple pieces, you can mix them with the dough. Pour this mixture into the mold, without disturbing the pieces at the bottom and cook in a medium oven for 30 minutes. Make sure that the cake bakes well, by pricking it with the tip of a knife, which should come out dry. Invert the pan on a serving platter. Gradually pour the pineapple juice over the cake to let it drink it in it makes it much more moist. Is a sachet of baking powder = a spoon? Preheat the oven to 180c and grease and line an 8 inch cake tin. The importance of doing this stuff first cannot be stressed enough. The quicker you get that cake into the oven after it’s mixed the better your cake will rise. This rule applies to all cake, pretty much, and I’m actually embarrassed at how long it took me to figure this out. Anyways, cream your butter first and then gradually add the caster sugar and whisk, scraping down the sides of the bowl. Add the vanilla and continue to whisk until the mixture is pale and fluffy. Break the eggs into a cup/jug and whisk before gradually adding to the butter and sugar. Make sure to keep scraping down the sides. Once the eggs have been mixed in, add the lemon zest and fold in. Next, add about a third of the buttermilk to the mix and fold it in gently. Then add about a third of the flour, again folding in gently. Repeat this until you’ve used up all the buttermilk and flour. You should have a pale, fluffy batter. Transfer to the tin and spread the mixture evenly. Sprinkle the raspberries over the surface mixture and press them half-way into the batter, so you can still see them. Vary it a bit, too, because sometimes the cake can rise so much that the sponge covers all of the raspberries, which is fine, but it looks much prettier when you can see the raspberries peeping out from the lovely golden sponge. Sprinkle the demerara sugar over the top and place the tin into the oven to bake for 35-40 mins. When the cake is golden brown and springy to the touch, take it out. Do a skewer test too, just in case. Set the cake to cool on a rack for 5 mins, then run a round edged knife around the edges of the tin and remove the cake from the tin. Set the cake on the rack to cool. It’s best eaten warm, when the raspberries are gooey and at their most flavourful, but it keeps really well and it a lovely, moist cake. Highly recommend with a good cup of tea. Also, I have to add that this cake is inspired by a recipe I came across in a GBBO cookbook, Great British Bake Off Everyday. It’s a favourite of mine and I’ve gone back to it so many times, because it’s a solid cake. A friendly cake, if you will. Have you tried self-raising wholemeal flour yet? Odlums do it now. I use it in chocolate or almondy cakes as I think they disguise it. No, but it sounds dreadfully intriguing. I’m thinking some sort of flapjack type affair with roasted nuts and cranberries and dark chocolate. Possible some orange. That’s one of my top five flavour combinations. You could even go wild for Christmas and add mixed spice and cinnamon. I’ve an awful goo on me for brownies too. I’ve just looked closely at the photo of the cake and I now realise that the texture is right. It’s just so gooey with all the booze and figs that it’s quite sticky. Stop it. That’s only massively tempting. Rahul looked like he thought Paul was going to nut him instead of giving him “the handshake”. I dunno about him: he seems a bit greasy or something. Unlike you, I thought the technical looked gorgeous. I wonder whether they get a hint as to what it should look like though, considering the apparent scarcity of detail concerning the recipe. There’s no way anyone would know how that cake should have looked. I missed a bit of it: did they show Luke out and about with his girlfriend? I would not have thought he would have a girlfriend, to be honest. That cocky one is growing on me. Ruby? Briony did not have a good week. The aul wan with the short hair has the right attitude, I think. She knows how to bake and just gives it a whirl. I like Manon too, and Dan. You’re right. Jon is a dark horse. All delighted when they had to make whatever that sponge was for the technical. In fact, I must say I like them all. No favourites so far but I agree that aul twirly moustache is all style, no substance. I really enjoyed last night’s episode. Yer man who got sent home was a completely forgettable contestant to me, an extra if you will. Looking forward to bread week and Frilly’s commentary. There aren’t layers so I guess it’s classed as a fruit cake, tried to copy the link, not sure if it’ll work, it’s a beautiful cake served with clotted cream but it’s no show stopper to look at. That does look lovely. Who cares if it’s not fancy: so long as it’s delicious. I missed last week but caught the first half of this week. Kind of devastated I missed traybakes. Might have to go back and watch for the candied nuts and lemon meringue. It’s kind of hard to get a feel for who’s good at this stage. Sometimes you can get a feel for it like with Mary Anne from season 1 or Richard from season 4. You just knew straight away that they were top 3 material. 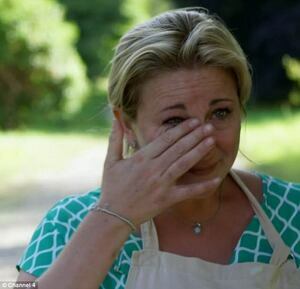 To this day, Mary Anne’s Sacha Torte mishap is probably my favourite in gbbo history. I think you’re right about Terry. He may yet surprise us but I don’t see him lasting past the midway point. He’s all moustache and no trousers. Good job, Frilly. Really enjoyed this one. And actually, the green cake. I have serious reservations about this cake. It was positively virulent. I warmed to them all much more this week. I love Noel. He’s a gentle guy. And lived with Lee Mack for years. Noel is a gem. I really didn’t think I’d like him but he really fits. Not sure how I feel about his hair yet. I’ve seen series two of Ozark. They had no cake. He looks fine to me. Star baker material for sure. And while I’m here, I really don’t like your tone. Not classy at ALL. To be fair, he’d had the same barnet for years. A change is as good as a rest. And, as me aul doll might say, it’ll grow.